How do I become proficient? What is included with Kwik Kerb? Kwik Kerb’s franchise-like business system has been helping people like you achieve their dreams by starting their own profitable landscaping business. Kwik Kerb works because it’s EASY! Anyone who follows the system, loves to work outdoors and has a great attitude can operate their own successful landscape curbing business from day one. The best part is you don’t need any previous landscaping or business experience! With Kwik Kerb, you’ll benefit from over 25 years of experience. You will be fully educated and trained step by step in how to run the business, attract clients and become proficient at doing so. Kwik Kerb’s proven comprehensive training course and ongoing support ensures you’ll be ready to serve and satisfy your customers in no time. Kwik Kerb’s proven system utilizes unparalleled concrete curbing machines, unique products, training, ongoing support, and marketing techniques. Landscape curbing is increasing in popularity everyday and Kwik Kerb is the leader, innovator and the original decorative curbing business. You’ll be able to take raw materials like sand and cement and turn it into cash – in one day! Landscape curbing is not just a product that people want or need, but it is something they will fall in love with and tell their friends and neighbors. Don’t take it just from us! No matter who you are or where you are, Kwik Kerb can help you start and run a successful, profitable and rewarding landscape curbing business for many years. "Hi, I thought it’s about time I thanked the people at Kwik Kerb. I'd be laying concrete today, and still enjoying it. This has been for me, the most rewarding and profitable businesses imaginable. the finished product Kwik Kerb produces (with a bit of help from me). I also have had clients who sell their homes and get me to lay landscape curbing for their new yard. Thanks again for helping me obtain a great business and lifestyle. Kind Regards A Very Happy Kwik Kerber Garry Purcell"
The Kwik Kerb business system was designed to be a home based business that keeps your overhead low and your profits high. You travel to your client’s home, create stunning landscape curbing, get paid, and then simply park your trailer back inside your garage. Kwik Kerb presents an opportunity to be your own boss, determine your own hours and spend more time with your family and friends. If you have dreamed of owning your own successful business, you should carefully consider owning your very own Kwik Kerb business. Starting a business that has an established brand name and business model takes much of the risk out of a new enterprise by giving you a proven system that has worked time and time again, for thousands of business owners before you. This is exactly what owning your own Kwik Kerb business gives you – a successful, proven, systemized business concept. 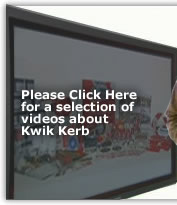 However, Kwik Kerb is not a franchise. There are no fees, no controls and no reports like franchises. You make the calls, you keep all the profits. If you’re a highly motivated individual and want to take control of your financial future, Kwik Kerb can help you create and live a lifestyle that accompanies your home based business. We provide everything you need to run a profitable landscape curbing business wherever you live. Kwik Kerb is gaining popularity around the world, and we’re currently expanding in San Antonio, Houston, Dallas and Austin, TX, Miami, FL, Kansas City, MO and Charlotte, NC, as well as many other U.S. cities and other locations throughout the world. Contact us to become the next successful Kwik Kerb business owner today! Copyright © 2014 Kwik Kerb USA, Inc. All rights reserved.